The Magnetic Lasso tool in Photoshop Elements 11 works by analyzing the colors of the pixels between the elements in the foreground and the elements in the background. Then it snaps to, or hugs, the edge between the elements, as though the edge had a magnetic pull. Not always the easiest tool to manipulate, the Magnetic Lasso tool performs best when your image has a well-defined foreground object and good contrast between that object and the background — for example, a dark mountain range against a light sky or a black silhouette against a white wall. The Magnetic Lasso tool has some unique settings, found in the Tool Options, which you can adjust to control the sensitivity of the tool and thus aid in your selection task. Start out by experimenting with the Magnetic Lasso tool using its default settings. If the tool isn’t cooperating, play with the options. Width: This option, measured in pixels from 1 to 256, determines how close to the edge you have to move the mouse before the Magnetic Lasso tool snaps to that edge. Decrease the value if the object’s edge has a lot of indentations and protrusions or if the image has low contrast. Increase the value if the image has high contrast or smooth edges. 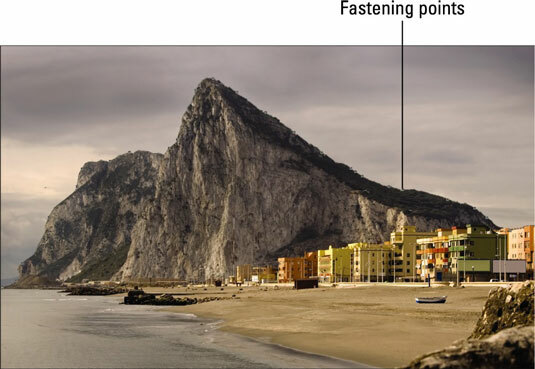 Contrast: Measured in percentages from 1 to 100, this option specifies the contrast required between the object and its background before the Magnetic Lasso tool snaps to the edge. If the image has good contrast between the foreground element and its background, use a high percentage. Frequency: This setting, measured in percentages from 0 to 100, specifies how many fastening points (points anchoring the selection line) to place on the selection line. The higher the value, the more fastening points used. If the element you want to select has a fairly smooth edge, keep the value low. If the edge is jagged or has a lot of detail, try a higher value to create a more accurate selection. Tablet Pressure (Pen icon): If you own a pressure-sensitive drawing tablet, select this option to make an increase in stylus pressure to cause the edge width to decrease. Select the Magnetic Lasso tool in the Tools panel. You can also press the L key if the tool is visible. If it isn’t, press L again to cycle through the Lasso tools. The tool looks like a straight-sided lasso with a magnet on it. Click and release on the edge of the element you want to select to place the first fastening point. Start anywhere, but be sure to click the edge between the element you want and the background you don’t want. Move your cursor around the object without clicking. The Magnetic Lasso tool creates a selection line similar to the other lasso tools while placing fastening points that anchor the selection line. Think of it as the way you might cordon off an area of your yard with ropes and stakes. If the Magnetic Lasso tool starts veering off the edge of your object, back up your mouse and click and release to force a fastening point farther down on the line. If the Magnetic Lasso tool adds a point where you don’t want one, simply press the Backspace (Delete on a Mac) key to delete it. *If the Magnetic Lasso is misbehaving, you can temporarily switch to the other Lasso tools. To select the Lasso tool, press the Alt key (Option key on the Mac) and then press the mouse button and drag. To select the Polygonal Lasso tool, press the Alt (or Option) key and click; don’t drag. Continue moving the mouse around the object and then return to your starting point; click and release the mouse button to close the selection. A small circle appears next to your cursor, indicating that you’re at the correct place to close the selection. The selection border appears when the selection is closed.